Career baby gift baskets! Big dreams for these Bundles of Joy! We have done it again!! 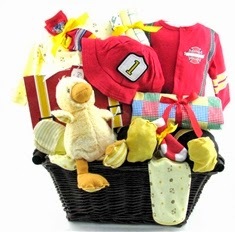 Every Season we try to outdo ourselves with the selection and interesting themes of baby gift baskets! I do have to admit it is getting a lot harder to one up ourselves! Our customers often ask us "How do you come up with these themes?".... Truth is its quite simple we turn to the best source available for inspiration! Our customers! 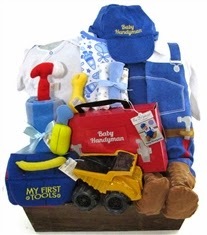 We survey our customers to find out what they really want and what they would like to see in our gift basket collection and some of the top baby themes are..
Baby Handy Man, comes fully loaded with a plush "My First Tools" Tool box by Gund with all the essential plush tools to get your little handy man started! Imagine how cute your baby will look wearing these cute overall sleepers while toting the super cute tool box! The classic Baby Golfer is what inspired this whole collection! We originally launched this gift many years ago and it was an instant success. As soon as it would arrive in our facility it would sell out within a few weeks. 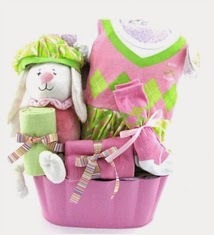 We took in one step further and now we have the baby Girl Golfer baby basket. These two sets are bright and colorful making them ideal for the summer season. Baby M.D. and Baby Nurse... These babies will be ready to give their first check up in these adorable outfits. Complete with surgical cap, booties and printed stethoscope on the jumper. 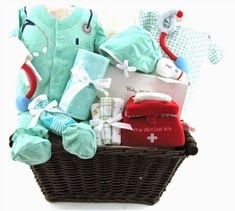 Imagine the scene at the hospital when your newborn checks out wearing this Baby MD or Baby Nurse gift set. Baby Pilot, Baby Fireman, Baby Rock Star! Among the top professions that every little child aspires for! Being the true heroes and heroines that are always there to save the day! Big Dreams for the new little bundles of joy.